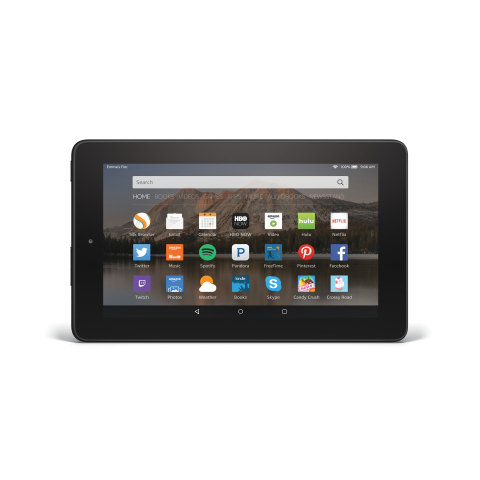 SEATTLE--(BUSINESS WIRE)--Sep. 17, 2015-- (NASDAQ: AMZN)—Amazon today introduced a groundbreaking new tablet for under $50. The new Fire tablet includes a quad-core processor, 7” IPS display, front- and rear-facing cameras, up to 128GB of expandable storage, exclusive Amazon features and services, and access to the world’s best content ecosystem—all for just $49.99. Customers can also choose to buy Fire as a six-pack for less than $250. Fire delivers a world-class entertainment experience. With access to over 38 million movies, TV shows, songs, books, apps, and games, as well as exclusive features like X-Ray, ASAP, and Second Screen, Fire is great for watching movies, playing games, reading books, listening to music, and more. With expandable storage via microSD card and features like On Deck you’ll never worry about running out of entertainment, whether jumping on a plane or heading out on a family road trip. Best display of any tablet in its price class—Unlike other low-cost tablets that use TN displays, Fire’s 7” IPS display offers a great viewing experience with vivid and accurate color reproduction that can be seen at all angles. Quad-core 1.3 GHz processor—2x more processing power than Samsung Galaxy Tab 3 Lite at less than half the price; quickly and easily switch between apps, stream movies, and browse the web without waiting for your tablet to catch up. Durability—As measured in tumble tests, Fire is almost 2x more durable than the latest generation iPad Air. Front- and rear-facing cameras—Video chat with friends and family with the front-facing camera; take and share photos, and save them for later with free, unlimited cloud storage for all photos taken on Fire devices. Up to 128GB of expandable storage via microSD—Enjoy even more videos, music, games, and photos while offline. All-day battery life—Delivers up to 7 hours of reading, browsing the web, listening to music, and watching video. Fire OS 5 “Bellini”—Includes an updated user interface that replicates the look and feel of a magazine, making browsing and searching for your content easier than ever—what you want is just one tap away; plus, Fire OS 5 includes hundreds of new and upgraded features and platform updates, plus Amazon-exclusive services. Amazon Underground—A one-of-a-kind app store experience where over $10,000 in apps, games and even in-app items are actually free—including extra lives, unlocked levels, unlimited add-on packs, and more. Have you ever forgotten to download a movie ahead of a flight? For Prime members, On Deck automatically keeps your Fire tablet current with popular Prime movies and TV shows, as well as Amazon Original Series, so you always have something good to watch. Importantly, On Deck only uses the available storage on your tablet, opportunistically in a special shadow mode. When you download something, On Deck automatically makes room for your selected content—there’s no hassle of needing to clear out space yourself. This feature will be available via a free, over-the-air Fire OS update in the coming months. Activity Center—For parents whose kids have outgrown Amazon FreeTime, Activity Center provides an easy way for them to see how their kids are spending time on their Fire tablet—from how much time they spend playing games, to which websites they visit. Activity Center will be available via a free, over-the-air Fire OS update in the coming months. World-class customer service and tech support—Mayday Screen Sharing lets an Amazon expert guide you remotely through any feature on your screen, available 24x7, 365 days a year—for free. Amazon-exclusive features—ASAP, X-Ray, Second Screen, Amazon FreeTime, Family Library, Word Runner, and more. World’s best content ecosystem—Access to over 38 million movies, TV shows, songs, books, magazines, apps, and games—with free, unlimited cloud storage for all Amazon content. Also available for Fire are new accessories, including a protective cover available in five colors—black, blue, orange, green, and purple—that can stand in both landscape and portrait orientations, for $24.99. Fire is $49.99, and will start shipping on September 30—order at www.amazon.com/fire. Fire is also available as a buy five, get one free six-pack for $249.95. In addition to Fire, Amazon also today introduced the new Fire HD 8 and Fire HD 10 tablets, Fire Kids Edition tablet, and the all-new Amazon Fire TV. 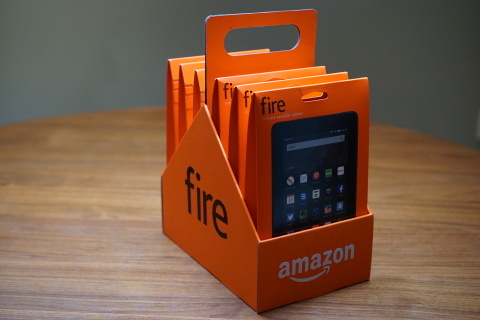 To read the press release about the new Fire HD tablets, visit www.amazon.com/fire-hd-pr. To read about the new Fire Kids Edition, visit www.amazon.com/kids-edition-pr. To read about the new Fire TV, visit www.amazon.com/fire-tv-pr. Amazon.com opened on the World Wide Web in July 1995. The company is guided by four principles: customer obsession rather than competitor focus, passion for invention, commitment to operational excellence, and long-term thinking. Customer reviews, 1-Click shopping, personalized recommendations, Prime, Fulfillment by Amazon, AWS, Kindle Direct Publishing, Kindle, Fire tablets, Fire TV, Amazon Echo, and Alexa are some of the products and services pioneered by Amazon.